Last week we looked at boondocking opportunities in the State of Kansas and the benefits of building a boondocking database. Following is another useful tidbit I ran across online and felt it was worth sharing. I have underlined the part pertaining to boondocking (aka dispersed camping). With activities such as hiking, sightseeing, hunting, off-highway riding, and fishing listed, it sounded like my kind of adventure in RVing! BISBEE, Ariz. — ForestCamping.com, the comprehensive website for camping in national forests and grasslands, recently visited Thunder Basin National Grassland. It is featuring the grassland with detailed up-to-date camping information, photographs and a number of its dispersed camping locations. Tucked into the northeast corner of Wyoming is 560,166 acres of wide open prairie with islands of pine-covered hills, Thunder Basin National Grassland does not have the developed recreation found in national forests. Instead, it is more like the Great Outdoors of old before the advent of today’s hurry-up pace. Thunder Basin National Grassland has no developed campgrounds, and that might deter some campers, but there are many dispersed camping opportunities. 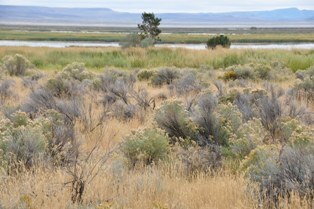 A few specific locations, such as Salt Well Picnic Area and Gibson Draw, are described in ForestCamping.com with GPS coordinates provided. It is recommended campers obtain a free Motor Vehicle Use Map from Thunder Basin National Grassland’s Douglas Ranger District office to get around in the grassland. Perhaps better known for the massive coal mines on it’s western boundary, Thunder Basin National Grassland provides the public a number of opportunities for recreation, including camping, hiking, sightseeing, hunting, off-highway riding, and fishing. It is a land that is a patchwork pattern of federal, state, and private lands, blending uses in ways to conserve and protect the land. In addition to managing and developing the U.S. National Forest Campground Guide website, the Dows have also self-published eBook CDs and downloads of the U.S. National Forest Campground Guides. They are organized by geographic region, which can be purchased online at their website. About ForestCamping.com ForestCamping.com, the U.S. National Forest Campground Guide, is a complete and comprehensive guide to developed campgrounds in national forests and grasslands. It provides detailed information to campers looking to experience the great outdoors.